Observation - Fly eating another Fly - UK and Ireland. 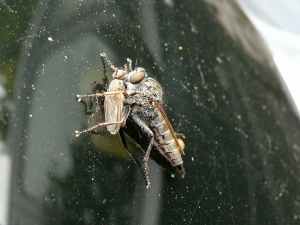 Description: I found this Fly with another smaller fly in its jaws, sitting on the windscreen of my car. Could anyone help with the ID please? I found this Fly with another smaller fly in its jaws, sitting on the windscreen of my car. Could anyone help with the ID please?